Empower is the first and only browser-based analytical tool that integrates earned value, schedule, work authorization, and other key performance data to enable proactive management of complex projects. Empower™ features an attractive and powerful user interface that provides immediate productivity gains for control account managers, program managers, support staff, and oversight organizations. 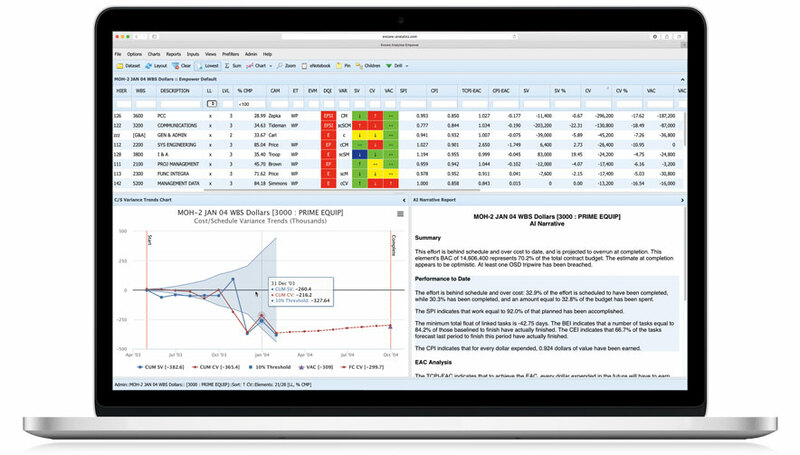 Empower is specifically designed to quickly locate problem areas, identify trends, display element-of-cost information, graphically display schedule Gantt information, provide immediate insight into data quality issues, support data-driven audit initiatives, and streamline the creation of narrative analyses with integrated workflow. The browser-based architecture provides a lower total cost of ownership than desktop tools, since no application is installed on individual computers. Updates are performed on a single server and user maintenance is centralized. Empower leverages your current software investment by seamlessly integrating with existing databases, migrating many of your customizations, and providing a familiar interface that will reduce implementation and training costs.